Having some extra lights on your Wrangler JL can help out on the trails in a big way. They can help on foggy days cutting through the fog or turning the dark night into daylight. 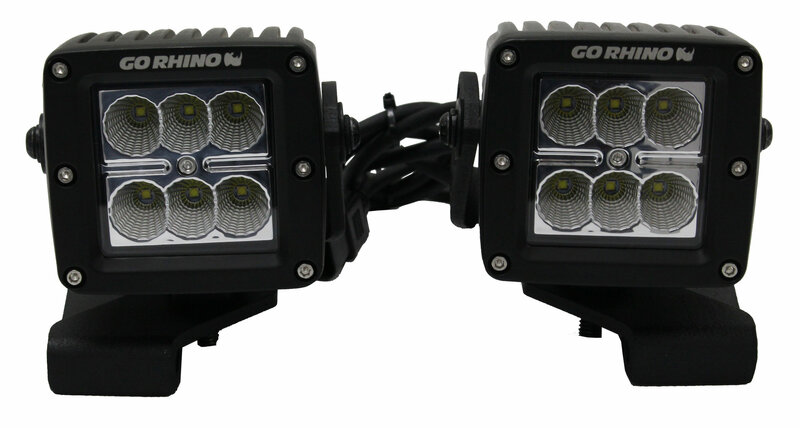 Go Rhino makes adding 3" cube lights simple to the hood of your Jeep with their 3" LED Cube Light Hood Mount Brackets. These brackets allow you to add two cube lights to your hood helping you out while off-roading. Made from quality steel that is powder coated so you don't have to worry about them breaking or rusting anytime soon. Low Profile Design: Gives you a sleek looking mounting system while not interfering with your sight line while you are driving. Installation: No drilling or cutting is needed to install these brackets. They just simply bolt into the hood hinges giving you a great location to put a light source. Rubber Gaskets are provided to protect the paint of your JL.